Daily Resort Charge will be added to the room rate and includes Premium WiFi two welcome drinks access to Spa and Fitness Center bicycle rental access to Golf Club practice facilities complimentary golf club rental after 2pm 10PCT off Spa services and pool cabana rentals local/toll free calls Waldorf Astoria Orlando is an elegant oasis of contemporary luxury nestled in a peaceful 482-acre nature preserve and conveniently surrounded by Walt Disney World Theme Parks. This luxurious hotel offers guests an ambiance of stylish sophistication replete with celebrated amenities and impeccable personalized service. An artful blend of comfort and modern elegance Waldorf Astoria Orlando has redefined the vacation experience. The resort offers a plethora of recreational activities perfect for enjoying and relaxation. Enjoy a round of golf on our Rees Jones-designed Waldorf Astoria Golf Club. rejuvenate in our luxurious Waldorf Astoria Spa. or take a refreshing swim in our pools and discover the ultimate escape in a private cabana. The resort*s dining experiences are unparalleled featuring world-class dining with twelve restaurant and lounges including the famed Bull - Bear. 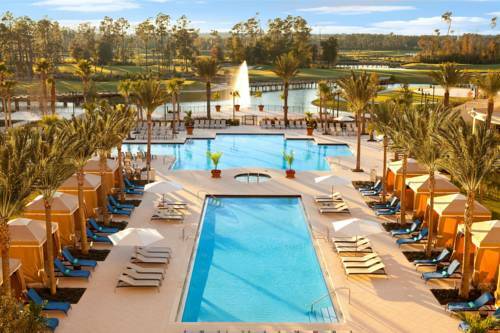 Guests of Waldorf Astoria Orlando are invited to enjoy the facilities and amenities of the adjacent Hilton Orlando Bonnet Creek including their award-winning 3-acre lazy river pool with water slide. Waldorf Astoria Orlando features 498 stylish guest rooms and suites featuring Italian marble bathrooms high-definition 42-inch LCD televisions Blu-ray player with DVD/CD/MP3 capabilities safes suitable for laptops twice-daily housekeeping and complimentary luxury transportation to the Walt Disney World Theme Parks. A replica of one of the most historic and well-recognized bars in New York City Bull - Bear Steakhouse serves hearty portions of traditional fare as well as weekly specials and fresh fish. Oscar*s serves modern American comfort food and reinterpretations of dishes such as Veal Oscar and Eggs Benedict which were hallmarks of the original Waldorf Astoria in New York City. The Clubhouse Grille is a casual grill located at Waldorf Astoria Golf Club. A casual pool-side restaurant featuring garden-fresh salads and bountiful sandwiches.